The book’s tone is so open and engaging, My Cross to Bear could appeal even to readers whose knowledge of the band begins and ends with “Ramblin’ Man”. Any one of Gregg Allman’s stories about his life could lure a reader into his new memoir, but the 64-year-old Allman begins My Cross to Bear with his biggest moment of shame, the induction of the Allman Brothers Band into the Rock and Roll Hall of Fame in 1995. Given such a forthright enticement, Allman has no trouble hooking readers with the unflinching details of his highs — musical and otherwise — and lows. He writes in a charming, Southern gentlemanly first-person voice with help from Rolling Stone scribe Alan Light and contributing author John Lynskey, a history and government teacher at a Miami high school who has chronicled the Allman Brothers over the years. 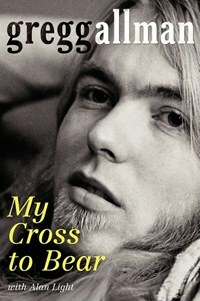 My Cross to Bear is essential reading for Allman Brothers Band fans. Lead singer, songwriter and keyboardist for the band since its formation in 1969, Allman never knew his father; he was only two when his dad was murdered by a hitchhiker. He lost his brother and bandmate Duane Allman, one of rock’s most revered guitarists, to a motorcycle accident in 1971 just as their band, guided by the production genius of the late Miami music legend Tom Dowd, was ascending to the A-list. His five marriages failed and one of them, to pop culture fixture Cher, made him People magazine fodder in the '70s. He had to testify against his band’s roadie for selling drugs to him and was blasted as a “narc” by Grateful Dead guitarist Jerry Garcia. He’s struggled with drug and alcohol addictions, battled hepatitis C and had a liver transplant. Just last week he had to delay his book tour to undergo heart tests at the Mayo Clinic in Jacksonville to address atrial fibrillation. Allman doesn’t spend too much time explaining why his marriages failed and gives only cursory mentions to his five children. But the book’s detail-rich examination of key events in his music career gives My Cross to Bear its dramatic momentum and value. The musician doesn’t skimp on dishing on the final acrimonious departure of founding member Dickey Betts from the band in 2000 or on his conflicted relationship as “baybrah” of Duane Allman. The book’s most indelible moments focus on the relationship between the two. At times, the memories are hilarious. One morning when they were children, Gregg was already working his mother’s last nerve for some infraction or other. Big brother, sitting in a wet bathing suit on a hard flat chair and already understanding the theory of amplification, seized on the moment by breaking wind, “like a (expletive) moose” and framed baybrah. The latter category, Allman writes, would include ex-wife Cher, whom he met at one of his solo shows in 1975.